At ThinCats, we have a policy of targeting our lending to growing companies. In doing this, we strongly believe that alternative finance is playing a positive role in increasing the productivity of British industry – where traditional lenders’ failure to do this was recently highlighted by the Bank of England’s chief economist Andy Haldane – thus making it more competitive. And, importantly, this means the creation of quality, durable jobs. We have been looking at what happens to companies we lend to, to see if that is indeed what happens following these investments, and this does indeed seem to be the case. 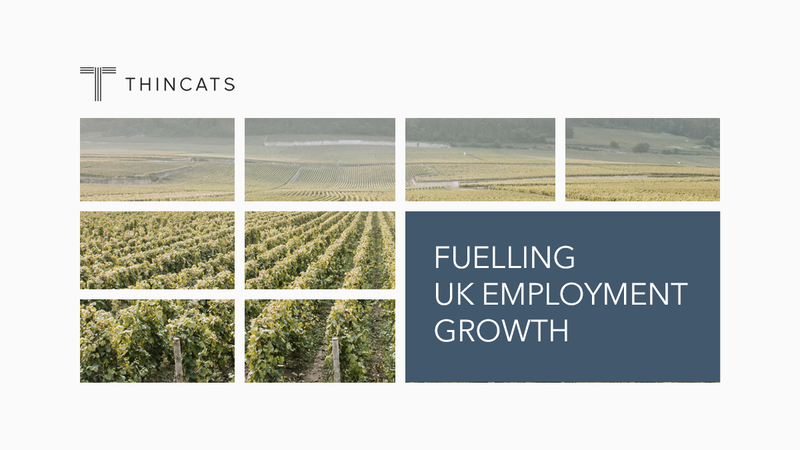 More than 80% of businesses funded by ThinCats have seen growth in employment, and the average growth of employment is 14%. This compares favourably with the broader UK jobs market, which is itself performing strongly: in July, the employment rate (the proportion of people aged between 16 and 64 in work) was 75.7%, higher than for the same time the previous year (74.9%) and the highest since comparable records began in 1971. That represents a year-on-year growth of slightly more than 1%. So, while indicators are trending up, our borrowers are adding employees at a faster rate. Many of those companies we fund have significant plans for growth. In June, we provided £500,000 to Newport-based estate planning company Carpeo. This funding will provide working capital and capital expenditure to the business, supporting the creation of 250 jobs at its new site over the next three years. What’s more, such job creation creates a multiplier effect within the broader economy, particularly at a local level. For example, a large proportion of the Carpeo investment will go directly into the local economy at the new site, with training and development of staff and enhancing skills of those employed being target areas for capital allocation. Another example is that of West Yorkshire-based Cubico, which sells bathrooms and related products to both trade and retail. Its £2m loan went to finance 10 new showroom openings, creating 40 new jobs in-store as well as 10 additional roles at its head office. Alternative finance is still a relatively young sector in the UK, going back little more than a decade. ThinCats – though an early mover – is younger still. But these examples, and this level of growth, demonstrates that it has great potential to provide the growth capital that British industry so desperately needs. A better solution to SME's event-driven funding needs? SME event-driven finance is fast becoming the natural terrain of the alternative finance industry. Before the financial crisis, banks dominated all areas of business lending. Alternative finance meant getting some money from your mum. But things have changed. Regulation over the past decade has forced banks to retrench. In the years immediately after the crisis, net lending to SMEs fell heavily into negative territory.